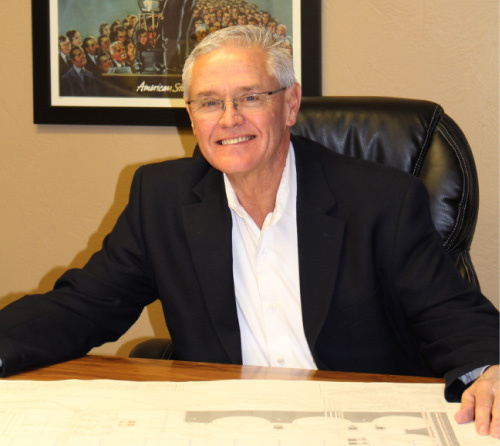 Meet the Owner – MMM Plumbing, Heating & Air Conditioning, Inc.
And A & R Mechanical Services with over 48 years of experience. 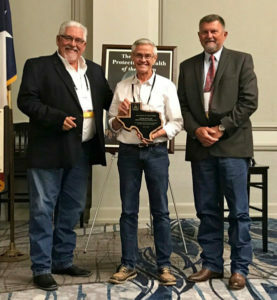 Dickie McCurdy received the 2018 Spirit of Texas Award from the Plumbing-Heating-Cooling Contractors of Texas at their annual business meeting on May 5, 2018, for his services in going above and beyond to resolve a business-related issue within the association. The Spirit of Texas Award is unique in that it is not given every year, but only when deserved. 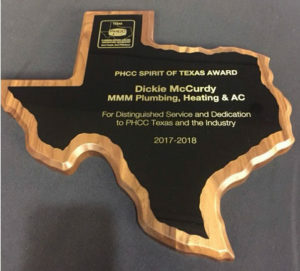 In his duties resolving the business-related issue, McCurdy was present for every meeting, conference call, legal discussion and more to protect the members of PHCC Texas in the resolution. A long-time member and board member of the PHCC Texas. He believes PHCC Texas should stand at the forefront of industry changes, updates or expansions as well as fight diligently to bring about fair business practices, an open environment for growth, and ongoing protection for the occupational licensees they serve. Since its founding in 1883, the Plumbing-Heating-Cooling Contractors Association is dedicated to the advancement and education of the plumbing and HVACR industry for the health, safety, and comfort of society and the protection of the environment.